And here is the U.S. cover for Maggie Stiefvater's upcoming standalone novel The Scorpio Races . Due out October 18th, precious few details are floating around about this one. But I am certainly intrigued. So far my favorite "official" words (of the like 20 there are being used to describe it) are: pair, race, and cliff. Of course, Maggie's are pretty good, too: blood, beaches, and kissing. I kind of like that we're not being inundated with info on this one. Makes for a refreshing change of pace. And I'm digging that pretty cover. So, I'm thinking I'll definitely be checking it out just as soon as I can. I agree that it's nice they're not telling us EVERYTHING about this book, but just a tiny bit of info would be nice. It's hard to be excited about something when I know absolutely nothing about it. I am at the point in my Maggie Stiefvater fandom that I will read anything she writes....needless to say, I will be reading this! I love all books by Maggie Stiefvater. The cover of this one looks amazing. Thanks for the heads up! Thanks for the heads up! I knew she was writing a new series, but hadn't seen the cover nor read those sparse words about it. LOL! I really love the font on that cover. I'm looking forward to reading it. Thanks for the heads up. I really like it. I'm also hoping to grab this one at BEA but I'm sure the line will be very long. Will miss you this year. 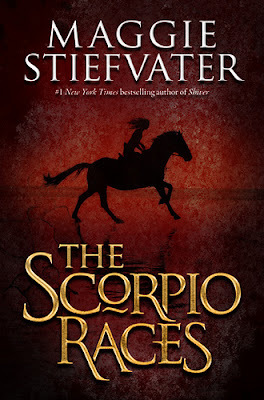 I have LOVED EVERYTHING Maggie has written...needless to say that The Scorpio Races has been pre-ordered! Can't wait to read it! I feel like I'm the only one who's read this already... if you are a fan of Maggie, she wrote this as a short story and it was included in the Merry Sisters of Fate Anthology that was published a couple of years ago. It might spoil some things about the story but if you can't wait for the fall, you can get a head start.